The April 2017 Readathon is here!!! This is where I will be posting sporadic updates throughout the day. Remember, for every comment on this post, I will donate $o.25 to the Ada Jenkins Center. You can read my Readathon TBR post here. Wish me luck for a wonderful day of reading! We made it! After falling asleep at midnight, I woke up at 7am to complete the final hour. So my total hours spent reading = 17! I’m quite proud of that. I finished 5 books, and started a 6th. 1. Which hour was most daunting for you? Around Hour 15-16, when I was really tired but wanted to stay up just a bit longer to finish the graphic novel I was reading. 2. Could you list a few high-interest books that you think could keep a reader engaged for next year? Definitely graphic novels! A lot of people seemed to be reading Saga, including myself. Ms. Marvel was another good one. 3. Do you have any suggestions for how to improve the Read-a-thon next season? Nothing other than the website problems – which are likely out of the control of the organizers. I couldn’t see the updates and links to mini-challenges after Hour 12. 4. What do you think worked really well in this year’s Read-a-thon? I loved the Litsy and Twitter feeds! I didn’t spend that much time in the Goodreads group. 5. How many books did you read? 5, and started a 6th! 6. What were the names of the books you read? 1. Will Grayson, Will Grayson; 2. Ms. Marvel, Volume 6; 3. Milk and Honey; 4. A Series of Unfortunate Events: The Reptile Room; 5. Saga, Volume 4. 8. Which did you enjoy least? Saga, Volume 4. Nothing to do with the content, by I was having problems using Hoopla, and it took about 20 minutes to fix it and be able to open the book to read it. At almost 11pm at night, that was a little frustrating. 9. How likely are you to participate in the Read-a-thon again? What role would you be likely to take next time? Definitely will participate as a reader again, and would definitely consider hosting a mini-challenge in the future. This will be my last update of the evening, as I am heading to bed, to read myself to sleep! Finished The Reptile Room, and switched back to graphic novels. I am currently reading Saga, Volume 4. I am hoping to wake up at 7am EST, to finish out the last hour of the readathon. See you on the other side! Up Next: Reading Saga, Volume 4, and then will either pick up Vol. 5 or 13 Reasons Why. It depends on how awake I am! Whose having a great time! This book nerd is! I’m definitely slowing down, but still plugging away on Book 4! I finished Milk and Honey, and have moved on to A Series of Unfortunate Events: The Reptile Room! Took a break for dinner, and to play basketball with M for a bit before the sun goes down. The whole night is ahead of us, and I am still excited! 2. How many books have you read so far? This is my 4th one. 3. What book are you most looking forward to for the second half of the Read-a-thon? I do actually plan on sleeping tonight, so my halfway point has come and gone, LOL. I may stick to graphic novels for the rest of the night, otherwise I’m looking forward to starting 13 Reasons Why by Jay Asher. If not for the readathon, then immediately after. 4. Have you had many interruptions? How did you deal with those? Only a few, but they were welcome interruptions! Mostly from my daughter and spouse. 5. What surprises you most about the Read-a-thon, so far? That I made it this far without falling asleep, considering I haven’t slept well in the past few nights! It’s definitely catching up to me now, though. Up Next: Currently reading The Reptile Room, not sure what I’ll pick up after that. The last few hours have not been quite as productive. I am about 2/3 of the way through Milk and Honey. I just took a long walk to take a break and move around a bit. It is so humid outside, I think the walk made me sleepier than reading all day! M bailed a few hours ago to go play at a friend’s house, but she read 5 books this morning before heading out the door! Don’t forget, for every person that comments on this post, I will be donating $0.25 each to a wonderful community nonprofit, The Ada Jenkins Center! The Ms. Marvel volumes keep getting better and better! I just polished off Volume 6 over lunch. Hosted by Estella’s Revenge. Create a six-word celebration of Dewey’s Read-a-Thon. Just finished Will Grayson, Will Grayson! A few interruptions this morning: a hungry, needy cat, a few phone calls, and a breakfast break, but I am satisfied with my current pace. LOVED this book, John Green and David Levithan’s collaborative effort is hilarious, powerful, and just plain fantastic. TINY COOPER!!! I love him so much. 2) Which book in your stack are you most looking forward to? Milk and Honey by Rupi Kaur. 3) Which snack are you most looking forward to? Chévre cheese with rosemary crackers, and my Chocolove Salted Almond Butter in Dark Chocolate bar. 4) Tell us a little something about yourself! I occasionally get insomnia, and have slept terribly the past two nights, so my readathon might not go as well as I had hoped! 5) If you participated in the last read-a-thon, what’s one thing you’ll do different today? If this is your first read-a-thon, what are you most looking forward to? It’s my first readathon in a really long time! I’m looking forward to my daughter participating with me! Book 1: Will Grayson, Will Grayson by John Green and David Levithan (starting at page 148). Dewey’s 24 Hour Readathon TBR!! I haven’t done Dewey’s 24 hour-readathon in years, and I am so excited to participate in the next one, which is coming up VERY soon on April 29, 2017! If you haven’t heard of Dewey’s Readathon, it is a book love fest where participants spend 24 hours reading books, talking about books, and posting about books on Goodreads, Facebook, Twitter, Litsy, Instagram and more! The first 24 Hour Readathon was hosted by Dewey at The Hidden Side of the Leaf in 2007. Sadly, she passed away in 2008 and the readathon was renamed in her honor. I last participated in the late 2010’s, and I am so excited to be back! I live in the EST zone, so I will be starting at 8am in my time zone on Saturday, April 29. 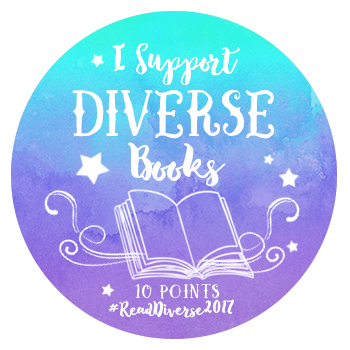 I am hoping to polish off at least two books for the #DiversityBingo2017 Challenge! Additionally, I am setting myself a philanthropic goal as well, and for this one, I will need your participation!! The Dewey Readathon’s emphasis is on philanthropy in addition to the social aspect, and I embrace that whole heartedly! I will be donating $1 to The Ada Jenkins Center for every page that I read during the 24-hour readathon, up to a maximum of $500! And for every comment that is cheering me on during the readathon, I will donate another $0.25 per comment, per person, up to a maximum of $100! That is a total of $600 that could potentially be contributed to an organization that promotes the importance of education and equal opportunity for all citizens, and helps those in poverty break the cycle and gain economic independence. I will be setting up one master post on the day of the readathon where I will be updating as the day goes on. All you have to do is send out some happy cheerleading vibes throughout the day by commenting on the post, and sharing it with others. The reason I chose The Ada Jenkins Center is due to my first-hand experience of all the wonderful things they do in my local community. The Center is a model for other community centers across the country, as a resource hub, a one-stop shop for a wide variety of social services and support programs. The purpose of LEARN Works is to partner with families, schools and volunteers to support the academic progress of students and advance family engagement. The after-school program they provide is AMAZING, and no child is ever turned away because of an inability to pay. Twitter: @abergsmanNC I will have a threat that I will be updating quite often! Litsy: 4thhouseontheleft – I’m just starting out on Litsy, but plan to use it frequently during the readathon! Please link to your platforms in the comments! If you haven’t signed up for the readathon yet, you can do so here!